VATICAN CITY (CNS) — The president of the German bishops’ conference said he was “strengthened and encouraged” by his discussion with Pope Francis about the case of a German bishop under fire for a massive building project that critics have denounced as extravagant. Archbishop Robert Zollitsch, the bishops’ conference president and recently retired archbishop of Freiburg, told reporters Oct. 17 that he would not share details of his meeting with Pope Francis that day because it was confidential. 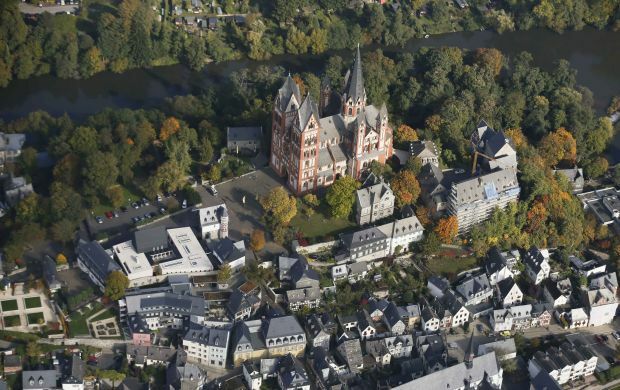 The archbishop said a commission he formed to investigate the project in the Diocese of Limburg would begin its audit Oct. 18. “After my meeting today with Pope Francis, I can assure you that all sides are interested in a good and speedy solution in order to bring tranquility back to the Diocese of Limburg and to find a way out of this difficult situation,” the archbishop said. The head of the Limburg diocese, Bishop Franz-Peter Tebartz-van Elst, had been in Rome since Oct. 13, but as of Oct. 17, his name had yet to appear on any list of people received by the pope. Bishop Tebartz-van Elst has been a target of protests for allegedly spending close to $40 million in renovations and new construction on his residence and diocesan offices, and for allegedly making false statements in court. 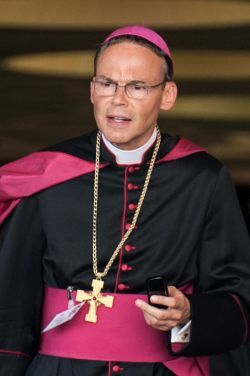 “It is not my place to judge the bishop of Limburg, but I am convinced he will undergo the necessary self-examination in the light of this situation,” said Archbishop Zollitsch, who was in Rome for the plenary meeting of the Pontifical Council for Promoting New Evangelization and for a regularly scheduled meeting with the pope as head of the bishops’ conference. Archbishop Zollitsch had said it was obvious that the situation in Limburg would be one of the topics of his meeting with the pope. “I take the situation in Limburg very seriously,” Archbishop Zollitsch told reporters Oct. 14. Bishop Tebartz-van Elst has been accused of living extravagantly while cutting diocesan programs, and critics have suggested that the renovation and construction project may have been funded in an improper way. The investigating commission, Archbishop Zollitsch said, includes experts in canon law, finance and construction. The members were asked to “clarify the costs” of the project, “how it was financed” and “how decisions were made to finance it.” Canon requires such large expenditures to be approved by a diocesan finance council or the Vatican. Regarding a separate allegation involving alleged luxury, a state prosecutor in Hamburg issued an indictment against Bishop Tebartz-van Elst Oct. 10, claiming he had given false testimony in court. The bishop had sued the magazine Der Spiegel for an article alleging he had flown first class on a trip to India for charity work. The German media, which often refer to Bishop Tebartz-van Elst as the “luxury bishop,” have been following him closely and frequently mention Pope Francis’ simple lifestyle as a contrast. This Bishop believes he has the right to spend whatever he wants to build whatever he wants. The people in his diocese should stop contributing so he doesn’t have any money to continue his foolishness.